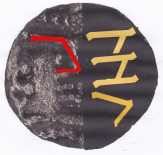 Image only shows position of Runes. 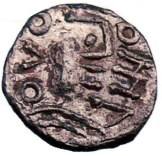 To see image of actual coin see image number 1997.8169 Early Medieval Corpus on-line database at the Fitzwilliam Museum Cambridge. In this type the head has a noticeably pointed nose and a rather angry look. Three annulets although placed in unusual places are featured. However, the ear is where the lips are usually placed and the lips appear misplaced below the ear. The artwork is very crude. The runes read clockwise and face outwards. All of the typical elements are present, however, the artwork is somewhat crude and is offset and worn. 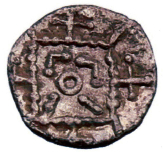 This single coin was found in Lincolnshire ID 36 and weighed 1.23g.